For higher throughput needs, the Primus is the next step up. Designed as a tandem central axle trailer, the Primus not only has 172 ft2 / 16 m² of effective screening area, it also offers a screen length able to handle big jobs. Heavy-duty components, manually folding discharge belts, the hydraulic drum drive via roller chain 'drum grip' and a fuel-efficient diesel unit give this machine an excellent price/ performance ratio. Options are available that allow users to configure the machine for their specific requirements. 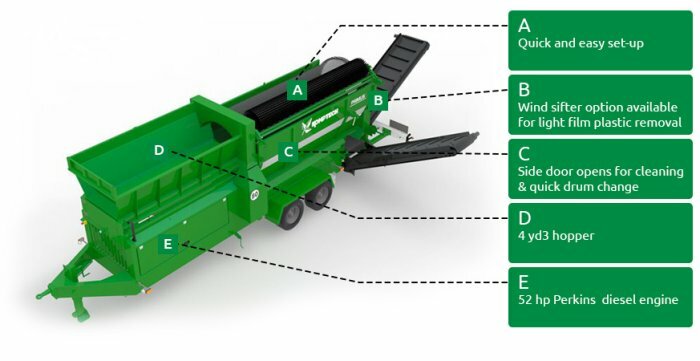 The Primus is the right solution for smaller and mid-sized composting plants, as well as for getting into contract screening. No reviews were found for Komptech - Model Primus - Hydraulic Central Axle Trailer Screen. Be the first to review!